Another year, another Artichoke Festival! Did you know that the first ever Castroville Artichoke Festival crowned Marilyn Monroe as the Artichoke queen in 1948? Here we are decades later and my small video production company is working with an internationally known event. Mag One Productions is privileged to be part the 2015 Castroville Artichoke Food and Wine Festival and its dedicated team. 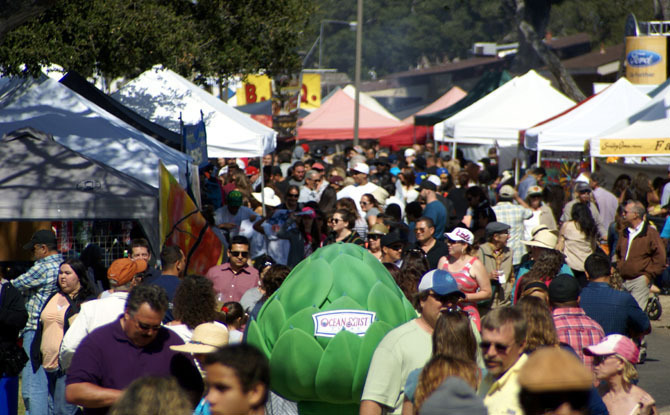 The Artichoke festival is a local annual event that continues to grow with every year. As the Salad Bowl of the World, our area yields an array of different fruits and vegetables including garlic, lettuce, strawberries and—of course—artichokes! Every year, the festival is a new and exciting experience with a family oriented approach to fun. There are always interesting things to check out like the Agro Art contest that displays local artist’s work made completely from local produce! Artists and contestants put to use their sculpting tools, imagination and a box full of artichokes, broccoli, lettuce and other locally grown greens to create intriguing sculptures for the public to admire. The Artichoke Festival also features masters of the culinary art, including Executive Chef Tony Baker, owner of Baker’s Bacon and Chef/Partner of Montrio Bistro Monterey. Throughout the day, multiple chefs demonstrate different and unique ways of cooking with fresh artichokes. You can pick up tips and techniques or even try their delicious works! Along with delicious plates, the artichoke festival also features wine tasting from wineries throughout California. After enjoying a glass of wine and a chef demonstration, you can check out the farmers market and the artichoke eating contest. The Farmer’s Market offers fresh artichokes and locally grown produce straight from the heart of the nation’s salad bowl! The most exciting feature of the festival is always the live music. This year the artichoke festival featured artists High Valley, Dallas Smith, Blackjack Billy, and more. The festival’s live music is the cherry on top. The rocking music makes the entire fairground buzz with electrifying excitement. This has been a fantastic opportunity and we’re excited to continue our relationship with the entire artichoke festival team including Denise, Katherine and the Edelman Marketing. Visit the Artichoke Festival’s website to learn more about next year’s event. Enjoy the footage of this year’s event and check out the commercial we edited (footage provided) on our YouTube page. Thanks again to the Artichoke Festival team and see you next year!